To lose a dog you cherish is a terrible thing. Losing a beloved dog is a frightening experience. If that dog is a pit bull type, the worry increases tenfold. I know this because Fergie is my first such dog, and she went missing last Wednesday, July 11th. 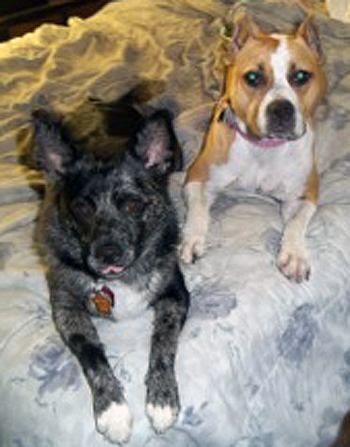 I’d spent a couple of hours at the dog park with Fergie, an American Staffordshire Terrier, and Bella, a Blue Heeler. On the way home we dropped in at my friend Catherine’s house, nearby, to introduce the dogs to the swimming pool. At no time were they out in the backyard by themselves. But no matter how careful you are, the unexpected can happen. 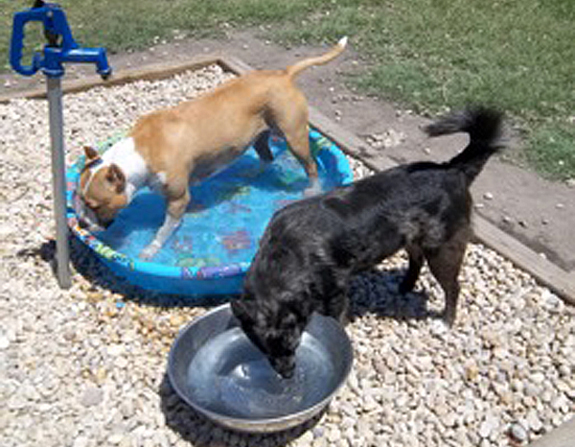 Fergie and her pal Bella weren’t out of sight for more than two minutes — but in that brief window of time, they found a hidden breach and were gone. The fence behind the bushes LOOKED secure, however, we later discovered that one board was attached at the top, but not at the bottom — so it could be nosed open. And Bella, my trouble-making escape artist, was just the dog to take advantage of such a weakness. The four of us went out at once, calling and searching — first on foot, then using our cars. Bella was found within the hour, trotting briskly toward the dog park. But my sweet, gentle Fergie had vanished. Fergie is my first pit bull type dog. If you had told me a year ago that I’d have this kind of dog in the house, I’d have said you were crazy. All I knew about pit bulls was what I’d seen in the media — and that, as we all know, isn’t good. But after adopting hyperactive Bella, I’d started investigating the local Norfolk dog parks. 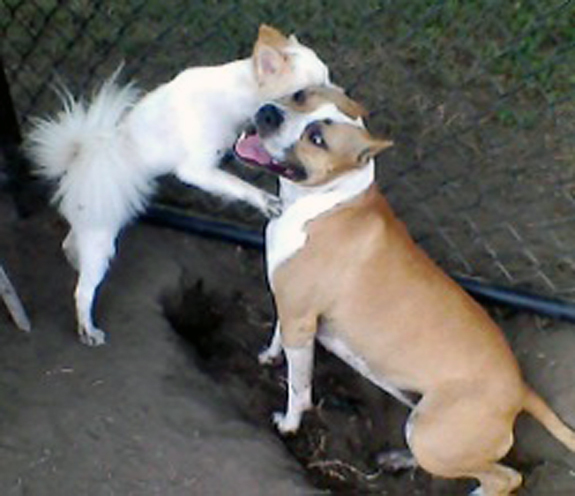 At the last one we found, the playmate she invariably sought out was a little gold and white pit named Fergie. 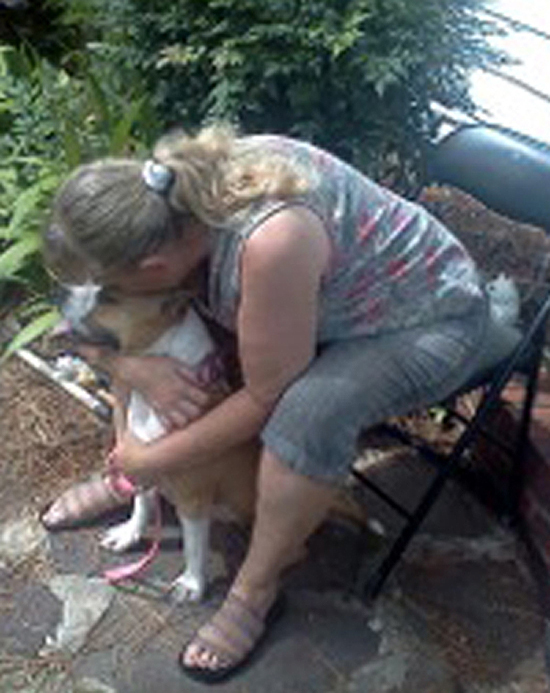 This dog was in foster care, after being rescued from an abuse/neglect situation in North Carolina. Every day for a month, I got to watch her romp with Bella and in that time, I never saw any inconsistency in Fergie’s behavior. She was sweet, diffident, and even-tempered. She had remarkable “bite inhibition,” and in taking a treat, she used her mouth carefully, delicately. And she’s a beautiful dog. She looks just like the champion American Staffordshire Terrier, Mad About You (Maddy), who won Best of Breed at Westminster recently. When her foster dad started interviewing prospective adopters at the park, I knew I couldn’t let her go to anyone else. I’d already fallen in love. In the year since adopting Fergie, she’s become the love of my life. When some people draw back because of her breed, I tell them, “This is the Sweetest Dog on Earth.” (You know you’re in trouble, when you start talking about them in capital letters like that.) Dog park friends call us for play dates, because Fergie specializes in drawing out other rescue dogs who enter the park feeling fearful and snappish. Even when aggressive dogs chase and bite her, Fergie never retaliates. And she and her sister Bella are inseparable, perfectly paired. And now, Fergie was missing. 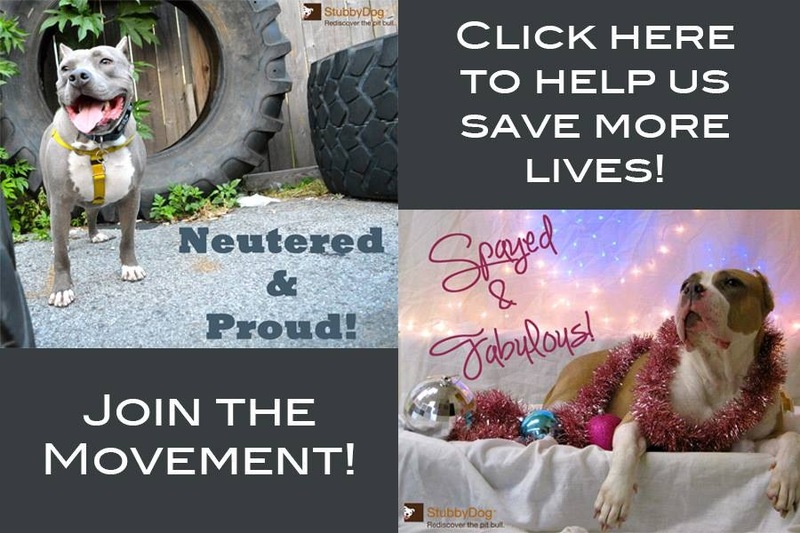 In learning about pit bulls this past year, I’ve become hyper-aware of the dreadful things that can happen to dogs of this type, should they fall into the wrong hands. To say that I was terrified is an understatement. I pictured her picked up by uncaring strangers — people who wouldn’t care that she’s frightened of storms, and needs a soft lap to sleep in. What if she were picked up by dog fighters? She’s been spayed, so they couldn’t use her for breeding. With her sweet temperament and unwillingness to bite, she would make the ideal “bait dog”! And that, of course, is where my imagination went. The scenarios I pictured, that first night without her, made it impossible for me to sleep or eat. And even if she were only picked up as a pretty stray, she could very well end up as a backyard tie-out dog. My timid Fergie, who is panicked by thunder and fireworks? Unprotected from parasites and heartworm? The thought was unbearable. Our street search was unsuccessful, so after dark we kicked into action in other ways. A trip to Walmart resulted in a new phone with an answering machine (which I hadn’t had before), in case someone called the number from the tag on Fergie’s collar. Back at my house, my friend called the microchip company to alert them in case Fergie was found and scanned. (I credit her with thinking of this; I was in a blind panic.) We then called the police. I was afraid of getting an “It’s just a dog, we don’t have time for this” response, or, even worse, an anti-pit reaction. However, the young officer who came to take our report was surprisingly sympathetic. “If someone took her, that’s a felony, and we take that seriously,” he said. “Taking someone’s dog is like taking their child.” Even so, he plainly had little hope that a young pit bull, once taken, would ever be recovered. “If someone picked her up and had good intentions, you’d think they’d have called by now.” Needless to say, I didn’t sleep that night. As a graphic artist, I was able to create and print out “LOST DOG” posters. 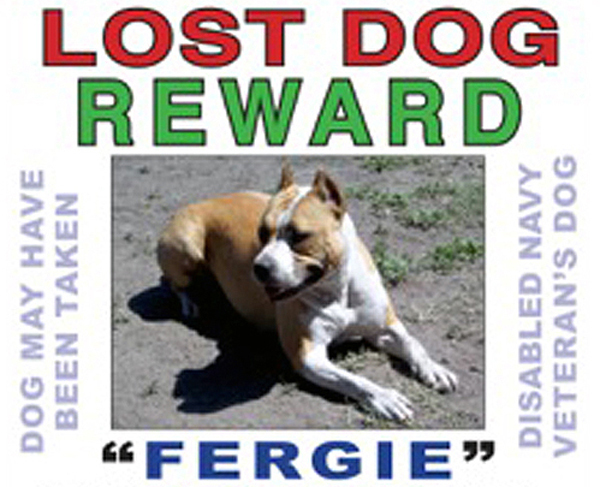 The word “REWARD” was prominently featured, above a recent color picture of Fergie. The lettering was large and brightly-colored; I wanted people in passing cars to be able to READ it on trees and light poles as they drove past. It also said the dog was microchipped, and that she “NEEDS MEDICATION” (which she does — during storms). During the initial search, someone had reported that a brown dog was seen being picked up by the driver of a silver Elantra, so I typed that in. I’m also a retired, disabled Navy veteran, so I added that detail to the plea as well. My hope was that the hope of a reward, or sympathy, or the complication of a “dog needing meds,” would tip the scales toward returning the dog. I hammered at every angle I could think of. The poster gave my home phone and cell numbers, and my friend’s number as well. 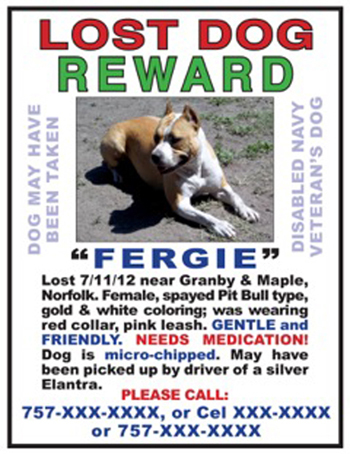 I emailed contacts at Norfolk Animal Control (where I’d done volunteer work), and gave them Fergie’s particulars along with a digital copy of the poster. (We visited there, and the SPCA, later in the day.) I put a “LOST DOG” ad on Craigslist (where too many pits end up “Free to good home,” or for outright sale). Online, I put her information and picture on Lostmydoggie, Fidofinder, and Helpmefindmypet. I alerted all my Facebook friends (many of these being Fergie’s dog park pals as well). If I’d heard nothing by the weekend, I’d put an ad in Sunday’s newspaper. One woman’s husband covered the story in his online publication. Friends as far away as China were worrying and rooting for her return. Two of them contributed to the reward! Early the next day — Thursday — my friends and I hit the road, and went to work. Having printed out local vets’ addresses from Superpages, we drove around and put up posters in every office. This was followed by similar visits to PetSmart, Petco, and Care-A-Lot Pet Supply. (Stores like these welcome you putting up “LOST PET” posters.) We put posters up in 7-Elevens and pizza parlors. We nailed posters on light poles, trees and street corners — making sure that the outdoor ones were sealed in one-gallon plastic freezer bags, against the possibility of being ruined by rain. By evening, we’d been proactive, we’d been thorough… and we were exhausted. And I was absolutely certain that I would never see my beloved Fergie again. Her friend Bella was also bereft. She didn’t know what to do with herself in Fergie’s absence. Who would she boss and herd around the yard, if Fergie never came back? It wasn’t as though I’d lost a cute little Poodle or Yorkie, I realized. If a little dog like that gets away, you can tell yourself that someone would take her in and make a house pet of her. But a pit bull? There are a thousand terrible things that can happen to a dog like that. And Norfolk isn’t like the small Ohio town I grew up in, where everyone knows everyone else. This is a sprawling urban area, and a loose dog is at much greater risk here. Even so, the people I encountered were so helpful, and so kind. Strangers called my cell, to let me know they were on the lookout. People I’d never heard of spread the word online. It was amazing. It reaffirmed my faith in people. My friend emailed me the photo. It was Fergie! Recovery would have to wait until Friday morning, so I spent another night on tenterhooks. More dire scenarios marched through my mind; surely I’d seen cases on “The People’s Court” where a “rescuing” family decides to keep a dog and goes to war over it? What if these people refused to give Fergie up? The first thing that happened, the next morning, was that Joe Flanagan of WVEC Local News called to ask if he could drive out and cover the story, which he’d seen online. I said, “Your timing is really good, because Fergie should be coming home this morning!” He said he was driving right out, and he and his cameraman arrived not long after Fergie herself. Only when she was safely back in my arms, wriggling and wagging and licking my face, could I finally relax. She came back wearing her collar, but without her ID tag — which her “rescuers” had apparently removed, without calling the phone number printed there. But they gave her up as casually as they’d decided to keep her. I can’t understand such an attitude. If I found a dog who had obviously been well cared for, wearing collar and ID, trailing her leash, I’d call the owner — or at least alert animal control. But they did keep her safe… she wasn’t killed on the road… so I can only be thankful. My little Blue Heeler, Bella, exploded with joy when Fergie reappeared,. They went racing around the back yard together like maniacs. She hasn’t let Fergie out of her sight since then. Neither have I! She was actually gone less than 48 hours — but it felt like a month, and I hope to never go through it again. BE PROACTIVE. Search, call, put up posters, go online. Visit the local shelters and vets’ offices. Offer a reward. Make sure your dog is microchipped and wears an ID tag. This might not help in a case where “rescuers” elect to keep the dog, but many veterinarians do scan new patients. And it is my understanding that all the shelters do as well. Email everyone you know. And keep your “doggy network” well-oiled. Without my dog park and Facebook friends, I might never have gotten Fergie back. But if this story proves anything, it is this: There IS hope of a safe return — even for a pit bull type dog.